LONDON (AP) -- Global stock markets started the new week on a soft note as investors waited to see if the U.S. slaps tariffs on another $200 billion-worth of Chinese goods. Oil prices rose, meanwhile, as heavy storms battered both countries. KEEPING SCORE: In Europe, France's CAC 40 was flat at 5,353 while the DAX in Germany dropped 0.3 percent to 12,087. Britain's FTSE 100 declined 0.1 percent to 7,297. Wall Street was set for a muted open with Dow futures and the broader S&P 500 futures down 0.1 percent. TARIFF TALK: Weekend reports suggest that President Donald Trump is ready to go through with threats to slap fresh tariffs on Chinese goods. Citing unnamed people it said were familiar with the discussions, the Wall Street Journal said the tariff level will likely be set at about 10 percent, below the 25 percent announced earlier this year. At the same time, U.S. officials, led by Treasury Secretary Steven Mnuchin, are preparing to hold new talks on the tariff dispute with Beijing. Envoys met last month in Washington but reported no progress. The two governments have already imposed 25 percent tariffs on $50 billion of each other's goods. Beijing has issued a list of another $60 billion of American products for retaliation if Trump's next tariff hike goes ahead. ANALYST TAKE: "The ongoing (trade) conflict between the U.S. and China continues to be a primary driver of market sentiment, with investors concerned about the prospect of a full blown trade war as neither side shows a willingness to blink," said Craig Erlam, senior market analyst at OANDA. ASIA'S DAY: South Korea's Kospi fell 0.7 percent to 2,303.01 and Hong Kong's Hang Seng index tumbled 1.3 percent to 26,932.85. 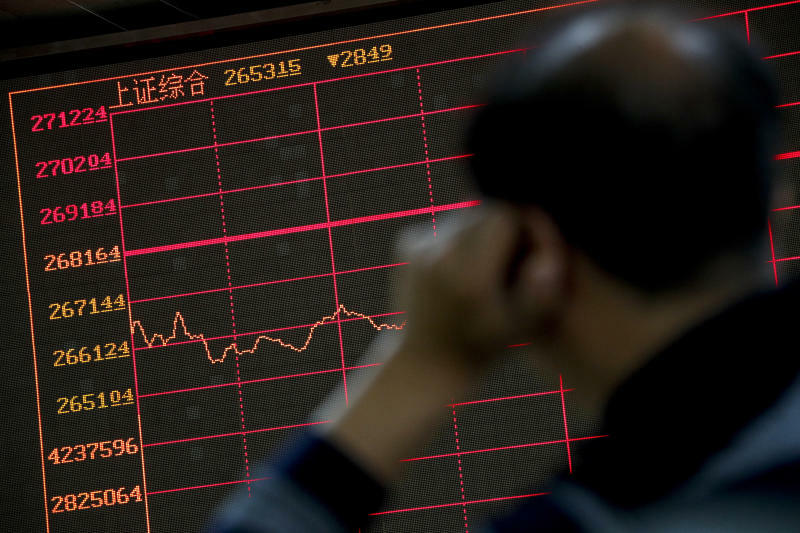 The Shanghai Composite index lost 1.1 percent to 2,651.79. But Australia's S&P/ASX 200 rose 0.3 percent to 6,185.00. Japanese markets were closed for a national holiday. ENERGY: Many of the headlines at the start of the new week have centered on the pair of storms that are hitting opposite ends of the world. Florence is making its way through the U.S. while Mangkhut has moved deeper into southern China. As well as causing death and widespread destruction, they have contributed to a push higher in oil prices. Benchmark U.S. crude added 47 cents to $69.46 a barrel while Brent crude, used to price international oils, gained 45 cents to $78.54 a barrel. CURRENCIES: The euro was up 0.4 percent at $1.1672 while the dollar was flat at 112 yen.